I've been excited to share this finish. I really worked hard at finishing this Hello Kitty top. I truly considered giving up on this project because all of those tiny squares! But one thing that kept me going was that I already had cut all of those squares and I didn't want all of that time and effort (and dull rotary blades!) to go to waste. Once the head of HK really became apparent, working on the rest of the quilt felt more exciting. And another fun thing that happened with this project is that my daughter, Charlotte (for whom this is for), really got excited about helping me with it. For about the last 1/3 of the quilt, I would tell her what color squares I needed, and she would choose them and lay them out for me. It was fun doing a "team" project. I also have to say that it is SO satisfying to look at this quilt and marvel that most of it came from my scrap bins. The only squares that weren't were the bright solid white and the dark gray prints (because I didn't have scraps of those). It's just so cool to make "something" out of "nothing." I added the purple border to make this quilt twin sized. The approximate size of this top is 72 x 88. I thought this was kind of a fun photo (below), it shows you how big this quilt really is/feels: like a giant stuffed cat is taking over our house. I am going to look into renting a longarm from a new rental source I discovered in Colorado Springs in order to quilt this quilt top. Cat fabric is so big right now- there are many lovely options for purchasing backing - especially this one- but I am pretty confident I will "force" myself to piece together something scrappy from my plentiful stash. Within this past week, I have been doing a lot of de-junking, purge/cleaning and I just have got to use what I already have! The Hello Kitty QAL was designed and hosted by Amy at Sukiedontyaknow. 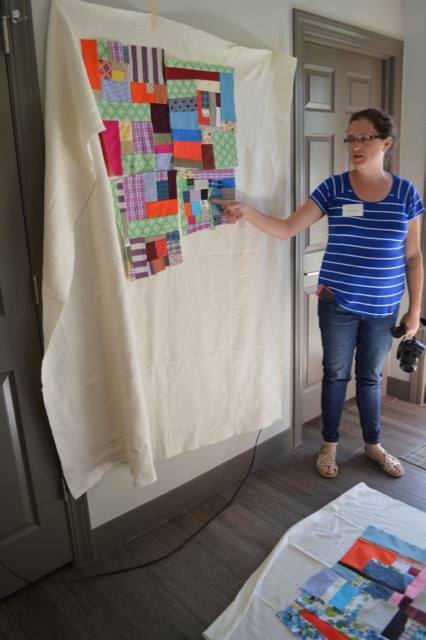 I've been in contact with her a bit about this quilt and have made sure to repeatedly voice my gratitude for putting together this tutorial. She really put a lot of work into it and it was well done and easy to follow. Check it out and make a HK quilt of your own. I finished this quilt over the summer but haven't blogged it yet because it's been really difficult to find the time and opportunity to photograph this quilt. The Blogger's Quilter Festival, hosted by Amy's Creative Side (happening right now) gave me the push to finally get a few outdoor photographs. This, of course, is the infamous "Fancy Fox" quilt, pattern by Elizabeth Hartman. I made it twin-sized with primarily my stash of Jennifer Paganelli's Crazy Love collection as well as other fabrics by Lizzy House, Anna Maria Horner, and Tula Pink. I used a Cloud9 solid available at Joann's for the background. I thought it was fun to choose bright, girly fabrics for this pattern because so many people make this quilt for boys and choose limited and more subdued palettes. I wanted to do something a little different and knew the gray background would make it all pop. This project was begun in earnest at the February FRMQG retreat and I let it sit for a while after that. I finished it in time to bring to Laurena's Longarm Quilting business this summer and rented a Statler Stitcher to quilt the rose pattern all over the quilt. I decided to use some voile from my stash from the backing. Laurena told me she would be concerned about the longevity of an apparel fabric on the back, which sent me into a minor panic, but I went with it anyway. Very few of our quilts get constant use, so I hope we will be okay in the long term. I did hand binding with an AMH Honor Roll print and came home to Colorado with a completed quilt. It felt so good! I really haven't done a lot of quilting lately and it felt great to have a WIP off of my "list." I am entering this quilt into the "Large Quilts" category since it's approximately 304" around. It's a generous twin sized quilt that has been nice for couch time relaxing... I am sure it will make an appearance in my daughter's room one day too. Thanks for visiting. One more completed bag to document and then I promise, I am really going to start working on more quilts! And then September 11 came (Charlotte's first day of preschool was the 12th) and it was also my husband's birthday.... and Charlotte even told me, "I can just use my Hello Kitty backpack for school, it's okay." But one thing I try to do as a parent, is honor my promises to my kids. I want to be dependable. So I stayed up late that night and finished the backpack at 11:59- just before midnight! I did a few modifications to the bag: I quilted the front with some batting and muslin backing, I added batting to the back exterior, I added woven interfacing to the leaf piece, and I used cording found in the home dec section of Joann's rather than going with double folded bias tape as recommended. The leaf pattern had to be copied at some odd size like 136% or something and it didn't fit the piece of fabric it was meant to be traced on very well. It may be due to an error in copying but I must add that I always find it annoying to visit a copy place before I can even begin to start my project. Rant over. So here's my little cutie on her first day. I managed to convince her to wear her 2T Cattitude rollerskate dress as a tunic- so happy I don't have to retire it yet! She's been using the backpack consistently at preschool, I kind of expected her to jump at the chance to use her store-bought Hello Kitty one... but I am not complaining. The strawberry backpack is not super practical but so adorable! I made an Art Student Tote (pattern by Anna Maria Horner) for me. I started this as a project to do with a friend on Labor Day. I got around to finishing it this week. I made a few modifications of my own: lots of interfacing within the interior and exterior bag pieces, I wrapped the strap fabric around nylon webbing instead of using interfacing, I added an interior zipper pocket, and I added a gusset with a zipper just inside of the bag. I've made this bag before and I really remember feeling much happier with my first version. I'm trying to figure out what the difference is. One thing that might improve this bag is top-stitching around the top- I didn't have the right color of coordinating thread, but will be sure to pick some up soon. The top edge is just looking so sloppy. Here's a picture of the back of the bag. How I love these pretty feathers! The interior of the bag was made from some of my AMH stash fabrics- they coordinated quite well without looking too matchy-matchy. Admittedly, this project is leaving me feeling a bit dejected. Maybe I am just tired, I don't know. I just don't love it like I loved the first Art Student tote I made. I don't understand the big difference. I am eager to return to some quilt WIP's now- something a little more "2D" is what I am craving. I am kind of forcing myself to work on WIPs lately- the space they are taking up is driving me a little insane. But I recently couldn't resist a new fabric pull centered around some of my favorite colors: red and pink. I decided to add in the dark brown to add contrast and not make it too Valentine's Day. Now I am on the hunt for more of the dark brown "Kitty Dreams" Lizzy House Catnap fabric. Any ideas? Do any of you readers know of a local or online source? And hopefully a more difficult question to answer, why is it so easy to fall in love with fabrics that are out of print and hard to find?! During my search for this fabric, I came across an online fabric store that specializes in only selling cat fabrics. Check it out. You're welcome. Over the summer, I learned that the FRMQG and Fancy Tiger were joining together to host Denyse Schmidt for a quick visit to Colorado. Being a little spoiled, I have had a few opportunities to interact with and learn from Denyse during my days in the BMQG. But I never made it to Connecticut to take her infamous improvisational patchwork class. I am kind of a frugal/cheap person when it comes to taking sewing classes. A lot of times, visiting instructors present on the exact material that is easily available in their recently published book; and I figure if I own the book, I have the information and don't need to pay more to take the class on the exact same material. I also like spending my money on fabric instead of classes. But I really am trying to place more value on experiences rather than "stuff," and I decided attending the class would be worthwhile if only being able to have fun with my friends from the guild. Well, I am happy to report that the class was excellent and I really enjoyed the time with my friends and I even made some new friends as well. It's so refreshing to sew together with like-minded people, as sewing can be such a solitary activity. Bags of cut-up, non-designer, vintage, upcycled, and thrifted fabrics were placed in paper bags and we sewed up blocks throughout the day with minimal prompts and instructions. 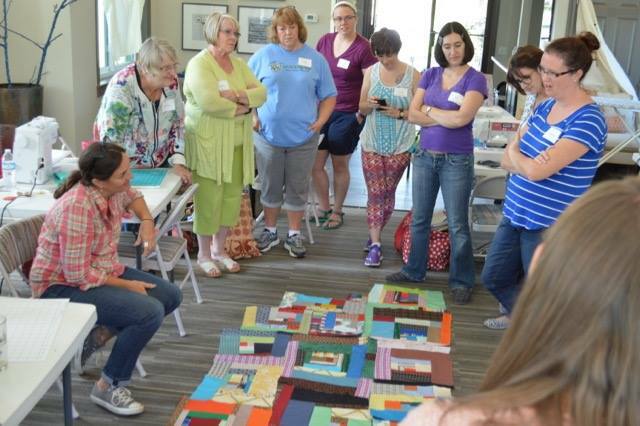 The whole exercise was centered around being able to sew freely without thinking too hard. Choosing fabrics was a component of the process that was essentially eliminated. I'll admit that I struggled with my perception of some of the fabrics, I found a lot of them to be quite ugly. It's also quite a departure for me to use fabrics that I don't absolutely love and even to use solids is unusual for me. So much of my sewing is connected to my love for fabric and the fabric designers.... it was good for me to look more at the composition of a patchwork design rather than just trying to allow the fabric to do all of the work. The last exercise of the day was dedicated to continuing the process of sewing from the paper bags of pre-cut fabric while also adding pieces of one fabric we had brought from our stash. After almost two hours of sewing, we were able to go around the room and share what we made. This is what I made. The green geometric fabric was my stash contribution. I am actually pretty happy with what I created and hope to finish it into something like a big patchwork pillow. Somehow I got to "present" first; it was very interesting to see what my other classmates made and what one stash fabric they chose to bring and how they incorporated it. Use my yard sale/thrifted fabrics more and don't be so afraid to mix them into all sorts of projects. Don't be afraid of solids. Improvisational piecing provides a lovely freedom I look forward to exploring more. It gave me a different kind of energy and excitement than simply making the same block over and over does. Try to use more unexpected and less "safe" fabrics in my projects, it adds more interest. Make a quilt because I like the design, start there rather than trying to decide how I can showcase some of my favorite fabrics. I really enjoyed my day with Denyse and the guild. I hope to take more classes in the future. I need to be patient though. I do think that in my current season of life, going to classes can be difficult, as my young family needs me and family budget concerns. In the meantime, I am going to do the best I can and take advantage of more opportunities like this.